Red Lodge, Montana, is the starting point of the Beartooth Highway, which the late CBS correspondent Charles Kuralt called “the most beautiful drive in America.” The highway straddles the Montana-Wyoming border as it wiggles its way to the northeast entrance to Yellowstone National Park (YNP), is situated about 670 miles (1,076 km) southwest of the Fargo-Moorhead Metropolitan Area, where we live. In July 1996, we””‚daughter Carmel, 12; son Junius, 16; wife Yoke-Sim; and I””‚planned an excursion that would include the Theodore Roosevelt National Park (TRNP) in the Badlands of North Dakota; the Yellowstone National Park in Wyoming; and the Mount Rushmore National Memorial (MRNM), near Keystone, South Dakota. This excursion was doubly important to Junius because it gave him the opportunity to prove his ability for driving long distances on the freeway. Another couple, faculty colleague Henry Chan and his wife Janet, joined us in another car on the forward journey to YNP. Two visiting females from Canada related to Janet accompanied them. We began our long journey at 7.45 a.m. on a Thursday (4 July), which was also the nation’s Independence Day. After I drove the first 100 miles on Interstate 94 to Jamestown, N.D., Junius took over driving all the way to the rest area near Richardton, N.D., where we ate lunch. He drove almost 170 miles! Then, Yoke-Sim took over and drove us to Medora, N.D., the gateway to TRNP, another 60 miles west. 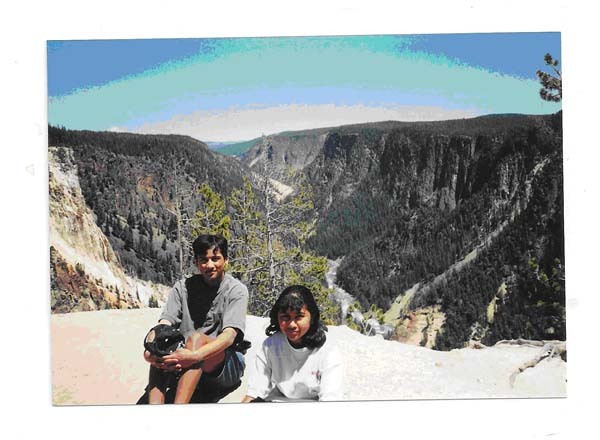 Now, in 1996, we were back, repeating history, on the same spot””‚the Painted Canyon Visitor Center! We intended to see more of the park this time. The TRNP, established in 1947 to honor President Theodore Roosevelt’s achievements in conservation as president (1901-1909) and for the landscape’s influence on his life, covers 110 square miles (285 sq. km) of land in three sections: the smaller North Unit, the larger South Unit, and the Elkhorn Ranch Unit in-between. The 96-mile Maah Daah Hey (“area that has been/will be in existence for long”) Trail and the Little Missouri River connect the three units. We skipped the North Unit because its entrance was another 80 miles north of the South Unit on US-85. Wildlife viewing is a popular activity in the TRNP, which is home to a wide variety of Great Plains wildlife: e.g., bison, feral horses, elk, bighorn sheep, white-tailed deer and mule deer, prairie dogs, and at least 186 species of birds including golden eagles, sharp-tailed grouse, and wild turkeys. TR came to the North Dakota Badlands in September 1883 to hunt buffalo. By the end of his hunting trip he had become the owner of the Chimney Butte Ranch, also called the Maltese Cross Ranch, about seven miles south of Medora. In 1884, Roosevelt purchased the Elkhorn Ranch, about 35 miles north of Medora, accessible by gravel roads. At Elkhorn, Roosevelt, as confessed in his later works particularly, enjoyed sitting in the veranda in a rocking chair, reading in the shade of the cottonwood trees. We entered the TRNP from the Medora Visitor Center, seven miles northwest of the Painted Canyon. As we entered the park, TR “himself” spoke to us at his Maltese Cross cabin. (In my public relations classes, I had learnt that TR was a very PR conscious president who greeted every one who visited him by the visitor’s name. TR studied the visitor’s profile the night before the meeting.). We decided to drive through the 36-mile Scenic Loop Drive in the South Unit. Driving anticlockwise, first, we stopped at the Scoria Point Overlook. Then, we stopped to go for a short walk on Ridgeline Trail. Next, we climbed the 2,855-ft. Buck Hill overlooking the Painted Canyon to get “the best view of the park.” Heading northwest, we stopped at the Boicourt Overlook. Finally, driving southward, we stopped at Beef Corral Pullout. We were fascinated to observe the several prairie dog towns scattered all along the scenic loop. After leaving the TRNP, Yoke-Sim drove us 60 miles to Glendive, Montana. Junius drove the next 80 miles to Miles City, where we stayed overnight at Motel 6. We regrouped with the Chans as we ate dinner at 4 B’s Family Restaurant. The next (5 July 1996) morning, we left Miles City and drove another 146 miles west on I-94 to Billings, where we had stayed overnight in 1989. Interstate 94 crosses North Dakota like a straight horizontal line into Glendive, Montana; then heads southwest through Billings, where I-94 merges into I-90. Our destination for the day was Gardiner, the north entry gate to the YNP, which we could have reached by heading westward on I-90 all the way to Livingston and turning south on US 89. But as we reached Billings, we decided to leave the Interstate freeway and drive 60 miles southwest to Red Lodge (pop. 2,200), Montana, on the more scenic and slower US 212. In 1896, Red Lodge, a coalmining town, had 20 saloons, and earned a reputation for riotous and violent living. By 1906 its population had grown to 4,000 and by 1911 to 5,000. The Great Depression forced the closure of many of its coalmines. We stopped at the public library and ate a picnic lunch on the banks of the Rock Creek. 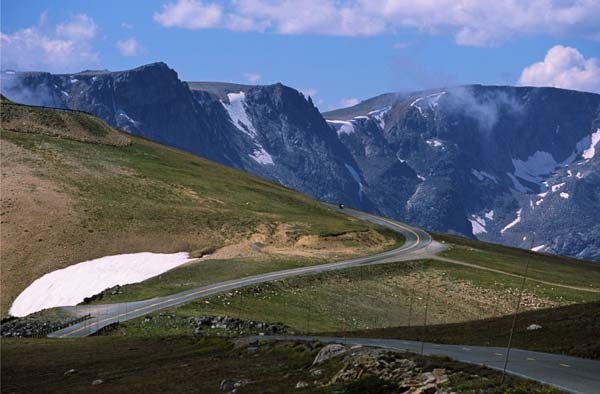 In 1938, the Beartooth Highway opened linking the town with the YNP. Yoke-Sim bravely took over driving from Junius to guide us through this 69-mile long Beartooth, which begins at 5,650 ft. and rises to the 10,974-ft. high Beartooth Pass via a series of steep zigzags and switchbacks through portions of the Custer National Forest and Shoshone National Forest along the Montana-Wyoming border. We stopped at lookouts to enjoy breathtaking views of idyllic scenery, including snowfields, little lakes and flower patches. Then, we descended in to the dense pine forest, and stopped to see the Hazardous Fall. We entered the YNP officially (current park fee=$25 per car) through its northeast entry point””‚Cooke City/Silver Gate (pop. 140), Montana. The YNP’s primary home is Wyoming but with extensions into Idaho and Montana (see map). Mudslides and rockslides forced the closure of the Beartooth Highway in 2005. Because of the dangers of slides, the highway is open only part of the year. From the northeast entry point, we drove 29 miles to Tower Junction, where we visited the Roosevelt Lodge, where we recalled our chat with TR the day before at the TRNP. We also made short trips to see the Tower Fall (132 ft.), the Calcite Springs Overlook and the Petrified Tree. We drove further west to Mammoth Hot Springs, and then north to Gardiner (pop. 851), Montana, where we spent the night at the Town Motel. Gardiner has been the main entrance to the YNP since 1872. In 2005, Gardiner became the venue for the YNP Heritage and Research Center. Yellowstone, which spans an area of 3,472 square miles (8,992 square km), was the first national park in the world, and is known for its wildlife and its many geothermal features, especially Old Faithful Geyser, one of the most popular features in the park. It has many types of ecosystems, but the subalpine forest is dominant. The Grand Loop Road provides access to the major features of the park, including the Upper, Midway and Lower geyser basins, Mammoth Hot Springs, Tower Fall, the Grand Canyon of the Yellowstone and Lake Yellowstone. Although we traveled only 144 miles Saturday (6 July), we learned much about the park’s geothermal undercurrents as we drove along southward on the Upper Grand Loop in the morning starting with the Mammoth Hot Springs. We passed landmarks such as Golden Gate, Sheepeater Cliff, Indian Basin, and Roaring Mountain. We stopped at Norris Geyser Basin, the YNP’ hottest geyser basin, to see the Steamboat Geyser and the numerous geysers along the Back Basin Tray. Thereafter, we drove 13 miles east to Canyon Village, where we walked around and ate our lunch in the vicinity of the Canyon Visitor Education Center. Along the North Rim Drive, we stopped at several lookouts””‚Inspiration Point, Grand View Point, Lookout Point, Lower Falls and Upper Falls””‚to view the canyon. Along the South Rim Drive, we enjoyed the canyon views from Uncle Tom’s Parking Area and Artist Point. We left the canyon area bout 4 p.m.
Eruptions can shoot 3,700 to 8,400 US gallons (14,000 to 32,000 l) of boiling water to a height of 106 to 185 feet (32 to 56 m) lasting from 1.5 to 5 minutes. The average height of an eruption is 145 feet (44 m). The highest recorded eruption was 185 feet (56 m) high. Intervals between eruptions can range from 45 to 125 minutes, averaging 66.5 minutes in 1939, slowly increasing to an average of 90 minutes apart today. We watched the 7.55 p.m. (6 July 1996) eruption of Old Faithful. Then, we walked on the boardwalks to explore the Upper Geyser Basin. We paid particular attention to Geyser Hill and Castle-Grand Group. We left the basin at 9 p.m.
We arrived in West Yellowstone, Montana, at 10 p.m. and checked in at His Westward Ho Motel, where we spent the night. 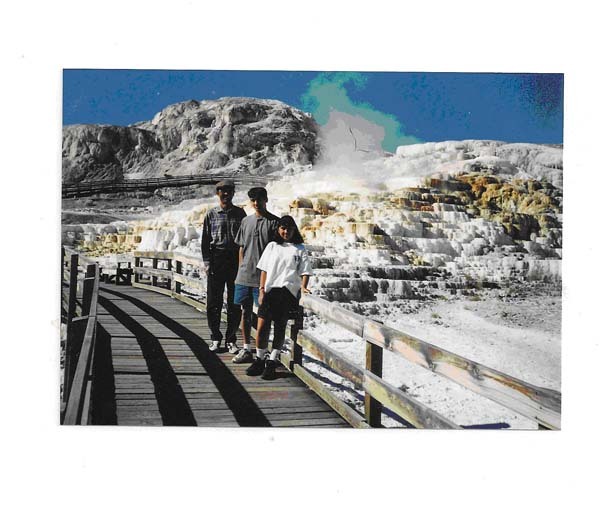 Picture 2: The author (left) with his son Junius, 16, and daughter Carmel, 12, on the Lower Terrace, close to Albright Visitor Center and Museum located at Mammoth Hot Springs, five miles south of Gardiner (6 July 1996). Picture 3: Junius and Carmel inspired by the Inspiration Point view of the 23mile-long Grand Canyon of the Yellowstone as we toured the North Rim Drive of the Grand Loop (6 July 1996). 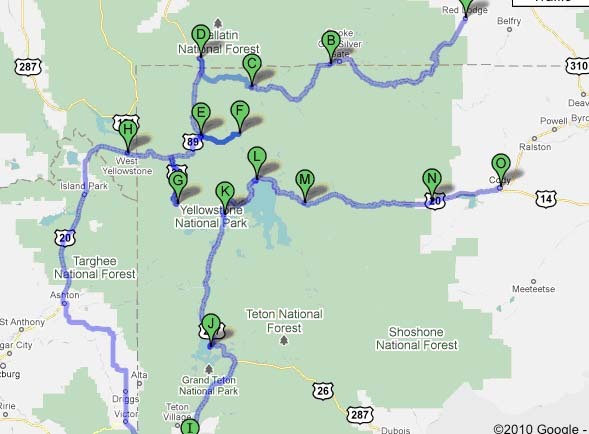 Figure 1: Our Tour Route in Yellowstone NP. A=Red Lodge, MT; B=Cooke City/Silver Gate, MT (Northeast entrance); C=Tower Junction, WY; D=Gardiner, MT (North entrance); E=Norris, WY; F=Canyon Village, WY; G=Old Faithful, WY; H=West Yellowstone, MT (West entrance); I=Jackson, WY; J=Colter Bay/Moran, WY (South entrance); K=West Thumb, WY; L=Lake, WY; M=Sylvan Pass, WY; N=Wipiti, WY; O=Cody, WY (East entrance).